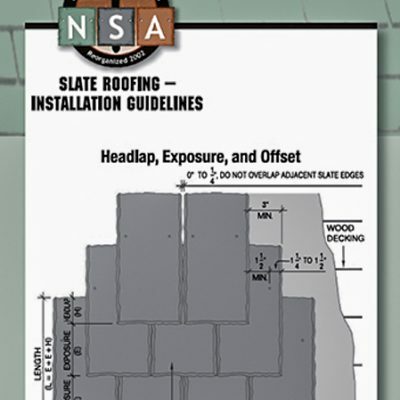 Asphalt shingles have long included basic installation instructions on the wrappers—the NSA Pallet Card, adapted from the NSA’s Slate Manual, performs the same service for slate installation. It is a weather-proof sheet, stapled to the slate pallets, that uses text and diagrams to illustrate basic procedures, such as shuffling slate, eave and valley lay-out, etc. Too often, developers are eager to use slate but not willing to pay for skilled installers. Unskilled laborers install a product they know nothing about. Since a failed roof comes back to haunt the whole industry, it is in our interest to give novices a chance to install correctly. For more info about the slate wrapper, please contact info@slateassociation.org.